Have you ever gone to the mall and fallen in love with the cinnamon and sugar pretzel bites. They are a little sweet and salty at the same time. These are easy to make, and one batch can make enough for a hungry crowd. Who doesn’t love pretzels? So often we just enjoy the crunchy ones, they are known for being somewhat healthy. These are soft and chewy pretzels. These are soft on the inside and they have an almost crisp exterior. 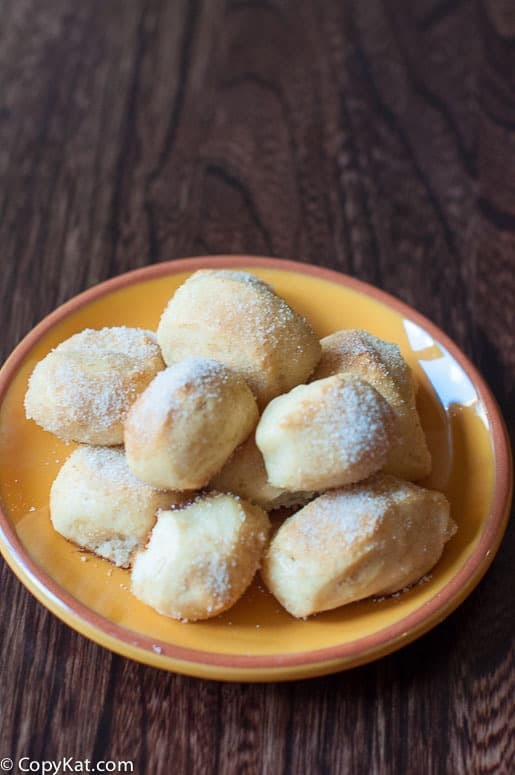 You will soon fall in love with these cinnamon and sugar pretzel bites. These are perfect to serve up with your next game night, or perhaps you want to serve these when you have a large card party. These taste wonderful when fresh out of the oven. I have been asked before if you need to dip the bread into baking soda water, my answer is a resounding yes. Why? If pretzels aren’t dipped in the baking soda water those balls of dough will simply be baked bread. The dipping in baking soda helps to brown the bread.
. When you buy this in the large bulk package, I think you get it at a much better deal then when you buy it in the grocery store. While dough is rising, prepare a baking soda water bath with 2 cups warm water and 2 tablespoons baking soda. Be certain to stir often. Once the dough has risen transfer the dough to a lightly greased work surface, and divide it into six equal pieces. Roll the six pieces of dough into 12" to 15" ropes. Cut each rope crosswise into about 12 pieces. Pour the cooled baking soda solution into a pan large enough to hold the bites. Place the bites into the solution, gently swish them around, and leave them there for a couple of minutes. Transfer them to a greased or parchment-lined baking sheet, and top with pretzel salt or sea salt. Bake the bites for 12 to 15 minutes, until golden brown. Remove them from the oven, and roll them in the melted butter. For cinnamon-sugar pretzels, toss with cinnamon-sugar once you've rolled the bites in the butter. Place the bites on a rack. If the bites aren't eaten immediately you should place them in an airtight container. The pretzel bites should be warmed before serving. Love Pretzels? Try these pretzel inspired recipes. I may just be overlooking it, but what is the oven temperature of baking? These are my favorite “walking around the mall” snack! I’ve never made my own pretzel dough, but I’m surely going to give it a try! Yum! I need to figure out how to make gluten free, sugar free, dairy free pretzels! I am sure there is a way to do it!